Irvine, California - Pasternack, a leading provider of RF, microwave and millimeter wave products, has launched a new extended series of mmWave, removable, edge launch, PCB connectors that are ideal for SERDES applications like high-speed networking, cloud servers and supercomputing. Pasternack's new line of high-speed end launch PCB connectors is comprised of 16 models in four end launch connector interfaces: 1.0mm (110 GHz), 1.85mm (67 GHz), 2.92mm (40 GHz) and 2.4mm (50 GHz). They provide VSWR as low as 1.10:1 and a wide bandwidth that supports high data rates. These high-performance end launch connectors don't require soldering and are reusable. Some models offer reduced profiles with a 0.350-inch mounting width, this reduced mounting profile allows engineers and technicians to fit even more launches in the same PCB area. 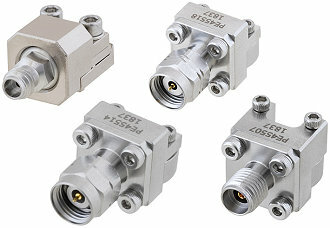 These high-speed end launch connectors feature an outer conductor made of stainless steel and a gold-plated beryllium copper center contact. They are offered in male and female genders. "This new expanded line of mmWave, removable, end launch, PCB connectors delivers exceptional VSWR performance along with a broad range of frequencies with even more models that are all immediately available with same day shipping," said Dan Birch, Product Manager. Pasternack's new high-speed end launch connectors are in stock and ready for immediate shipment with no minimum order quantity.